Microsoft is well known as a competition-killer as it tries to kill competition by various means. After ending the legion of Netscape years ago, Microsoft is returning to “digital dark ages” by blocking browser choice on ARM version of Windows 8, dubbed Windows RT. Mozilla and Google have accused Microsoft of banning third party browser from Windows 8 on ARM. There will have standard browser support in desktop edition of Windows 8, but the ARM version will be restricted to Microsoft’s Internet Explorer only. Mozilla is already working on a Metro-styled version of its Firefox browser and this decision is a huge blow to Mozilla’s plans. Microsoft is under fire from both Mozilla and Google. Mozilla accuses Microsoft of violation the browser choice rules set by European Commission (EC). Mozilla also reported in the post that Windows RT will have two environments – a Windows Classic environment and a Metro environment for apps. Meanwhile, Chrome-makers Google also verified the issue. Like Mozilla, Google is also planning to launch Metro version of Chrome browser. Google has also shared similar concerns regarding the Windows 8 environment restricting user choice and innovation. By locking the browser choice, Microsoft is limiting innovation in the browser space across all platforms. Google and Mozilla accuse Microsoft of anti-competitive practice with the ARM-based version of Windows 8. The exclusion of browser choice is going to affect tablet users and if the problem is not handled, PC users may also enter a similar fate in future. Looking at declining market share of IE, Microsoft is planning to block competitors like Firefox, Opera and Chrome from Windows 8, but the decision will raise antitrust concerns. Microsoft claims that it needs to restrict access to the desktop for security and performance reasons, and that’s why only a few apps get access to it, notably IE and Microsoft Office. Thats a bit of unfair reasoning that Microsoft has put up there. After all, on Windows 8 for PCs, other apps are allowed to run on the desktop. It may be true that Windows RT hardware will be more susceptible to performance slow-downs than traditional Windows hardware, because RT hardware will generally have slower processors and less RAM. That won’t always be the case, though, because Windows 8 will run on netbooks, which typically have low-end hardware. Another question that needs to be asked is Whether banning Chrome, Firefox, and other browsers from the RT desktop will make a difference to browser market share? AT the current rate, not many give much of a chance that Windows 8 tablets to make significant headway against iPads and Android tablets. And of the people who do use Windows tablets, only a very small percentage would likely switch their default browser, even if they had a choice. So in terms of market share, not allowing Firefox and Chrome on the desktop will barely register as a blip. As for user choice, it would certainly be better if Windows 8 tablet buyers had more than one realistic option in browsers. But limiting browser choice is likely to hurt Microsoft more than help it. Chromebook (Part V): The wish list for Chromebook improvements! I have featured Chromebooks in four blogs earlier. Read them here: The cloud kisses the laptop, Subscriptions that might have changed the industry standards, Google’s own iPad Moment and 10 reasons why Chromebooks haven’t really won a lot of admirers out there! (Not Yet!). This one is a reproduction of an article bv Desire Athow. Chromebooks are atleast 3 weeks off from stores and sales and inspite of the drubbing that Chromebook has received from Blogosphere, Amazon reports Chromebooks already in the top 20 “most wished for” items in the laptop category. The original Chromebooks though are far from being perfect and there are at least four things that can be done to improve the current generation quite easily actually. 1. ARM instead of Intel: ARM’s biggest strengths centres around its battery consumption. Toshiba AC100-10U laptop (ARM powered) , which runs Android, is cheaper by a third and weighs 40 per cent less while having a similar battery life compared to the average Chromebook. What’s even more incredible is that the AC100 uses a 2200mAh, 3-cell battery, compared to 6-cell 8280mAh monster on the Samsung Chromebook. Intel powered devices have more expensive and bulkier brick-type power adaptors, whereas ARM based ones are likely to have smaller, cheaper wall-type models. 2. Speaking of the battery in the Chromebook, making it removable would be a great idea as the laptop only supports up to 1000 cycles or around 18 months in the worse case scenario. 3. Bringing in an Ethernet port – a conspicuous omission – would also make a lot of sense especially if you have to set up the laptop in a notspot zone in the first place. 4. Connectivitywise, turning Chromebooks into hotspots would be a pretty cool addition indeed, something that Connectify does already for Windows and Google already achieved with Android since Froyo. The art of perfecting a product is a multi-iterative process and Chromebooks will also follow the same trend in time. Contd from earlier posts: The cloud kisses the laptop, Subscriptions that might have changed the industry standards and Google’s own iPad Moment. 1. While, Chromebooks can connect with external devices such as cameras (via USB) and headsets,it is maimed by the exclusion of Apple users. The millions of existing iPhone, iPad and iPod owners cannot use the Chromebook with those devices. That is one task the Chromebook can’t perform, and it is unlikely it ever will. Google will be looking at convincing Apple product owners that they need to switch, or forget the Chromebook. That is a huge unreachable market for a brand new product. (ZDNet). 3. As the recent Amazon Web Services outage demonstrated, cloud services can fail and customers can lose data (Information Week). Google itself has faced loads of Gmail incidents loosing valuable user data. 5. Google’s foray into hardware products have not really been successful. Need to look beyond the Nexus One and Nexus S? Has Google learned its lessons from its cell phone debacle? We’ll see. 6. We’d be forced to stick to a browser for hours. Is it not worth to wait 15 to 20 seconds for Windows 7 to boot on Netbooks and have the flexibility to work with any application? Microsoft came under heavy fire for taking advantage of its Windows operating system to promote Windows Media Player and Internet Explorer, even though you can download any browser using the IE. Now how about sticking to the Chrome browser for the entire life cycle of your Netbook! That’s really not a good Idea. People often criticize ‘Apple’ for crippling their devices off the features and for controlling the third party applications to generate more and more revenue. If that is bad, then have a look at Google’s business model. They have outdone Apple in terms of crippling the usability. Google wants you to buy a Netbook with nothing but a Chrome Browser onboard. All the applications you’d run would be within the browser; all your family photos and videos would be directly saved on Google’s server, multitasking is out of question (yes, there will be a new tab but that doesn’t count as multitasking), and it will update automatically without giving you the option to decide whether or not you wish to download and apply the update. 8. The Chromebooks aren’t suited to things like video editing, and they’re quite limited when it comes to most multimedia or design tasks. But the problem goes beyond an inability to run certain applications. In many cases the ease of usage and a friendly interface is lacking and will take some time to come up on its steam. 10. The Chromebook for all its cloud related advantages is not as trendy and path breaking as the iPad or the Android tablets. Could Google have been wiser to have worked on a ChromeTab as against a Chromebook. We will see that. 7% prefered a Google Chromebook because they thought it would be useful for their purposes, just browsing the net. 47% prefer to keep personal documents on PC/Laptop, suggesting that perhaps the cloud, or at least Google’s cloud, has little appeal. 26% respondents didnot know what a Chromebook was. The 26% is a good number, because it means that 74% respondents know the Chromebook. Unsurprisingly, a lot of people are skeptical. However, It’s worth remembering that the iPad similarly met with a barrage of criticism and did change how we think about computers. Continued from an earlier post. The idea of a computing device with most of the computing systems outsourced to the cloud is a novel one and has been around for a while now. Here are the reasons on why it is ground breaking? Chrome OS simplifies the operating system by putting most all applications and data inside the browser, and in doing so, it takes a multilayered approach to security, restricting each application to its own sandbox and introducing a verified boot sequence that seeks to identify malware at startup time. All OS updates, including security fixes, are automatically pushed down to the device over the web, and since virtually no applications or data files sit on device itself, it’s easier to set up a machine – or move to a new one when it is lost or stolen or bricked. What’s more, Chromebooks – equipped with flash drives – offer unusually fast boottimes. With a Chromebook users won’t wait minutes for computers to boot and browsers to start. This provides access to email in seconds. The Chromebook provides automatic access to updates which will get faster over time.All individual apps, games, photos, music, movies and documents will be accessible from wherever the user is and the Chromebook will provide freedom from hassles like worrying on loss of computer and data backing up. Just because the back end systems are lightb and easy, Chromebooks will last a day of use on a single charge. With optional 3G, accessibility to web is direct. Chromebooks have many layers of security built in so there is no anti-virus software to buy and maintain. The MAJORITY of Internet Users are people who only go onto the PC for four activities: Email, Shopping, Online Banking, Facebook. The fact remains that do not users get Dual or quadcore, 4 GB of memory, DDR2, DDR3, Photoshop, Video Editing, Access, Excel and Word is MEANINGLESS to most people who are not Professionals. Add to it the need to buy AntiVirus, Firewall Protection, OS maintenance and the hardware purchase turns onerous. Users just want to Log in, Look at their email, post to Facebook & Pay a bill. Beyond that, the the most strenuous task they’ll ever put on their laptop might be streaming a HD Movie. Although it remains to be seen how well Chrome OS works when deprived of internet access, the potential for Chromebooks to slash both IT support hassles and the amount of money spent on hardware and software is very enticing. We will get to know the response to Chromebooks in a while. But for me i think the idea of a ChromeTab is much more attractive and enticing. Google has smartly aimed it squarely at the enterprise and the education system. It will be sold to consumers, too, and that’s the market segment that may give Google the most fits with the Chromebook. Google will charge businesses $1,008 to use netbooks for three years. The subscription requires a three-year contract, and it includes not only continuous software updates but also a web-based management console, Google support, and hardware replacements.This translates into a $28 per user subscription plan for businesses and it can be an affordable way for small businesses to provide laptops to its users, but to really satisfy enterprise users, Google needs to woo its IT decision makers. The value here is that enterprise and education customers can count on a dramatic decrease in costs from a maintenance standpoint. Secondly, Google will provide 100MB of free 3G data each month through its partner Verizon wireless. Interestingly, the deal ends after two years (rather than lasting for the life of the product). Three years is an awfully long time, particularly when you’re dealing with a comparatively low-spec machine such as the ones announced from Acer and Samsung today (both of which will ship June 15th). But for businesses and educational institutions, is it good enough? It’s also worth noting that Google considered shorter contracts (with higher monthly fees), but it found during market research that most institutions never upgraded their machines before three years, anyway. Given that data, it just made sense to offer lower monthly rates and on a refresh cycle that fit nicely with what they found. According to a recent Gartner Research survey, typical businesses spend between $3,300 and $5,800 on each of its desktops. The subscription model for Chromebook will ultimately save a hefty portion of these dollars because the machine is both easier to administer and more secure than traditional machines. Google’s subscription plan, reduces the total cost of ownership to less than half what enterprises see right now. The Chromebooks would be launched 15th June and it would be interesting to note which way is it headed. Google on its part is firing all cylinders to ensure its success. Google’s IO conference had its share of moments with Google Music Beta service, The Ice-cream Sandwich, The Android Open Accessory development tool kit to bridge over the fragmentation and multi-device conundrum that they have had so long and the long awaited ChromeBooks. I had 2 years ago blogged about Light and Zippy Oss that would power the Internet computing world. That day it seems has finally come. Here’s documenting the Chrome powered Chromebook’s, Google’s Internet Netbooks. The web-only laptops fundamentally reinvent computers. Chromebooks are built and optimized for the web, where users are already spend most of their computing time. The Chromebook essentially enables a faster, simpler and more secure experience without all the headaches of ordinary computers. Google and its vast server farms take care of apps, backup, security, maintenance and support. The Chromebook is powered by the Chrome web browser and uses the HTML5 and other open standards platforms. With Google providing offline support, which now lets users access their Google Docs, Google Calendar and Gmail accounts without an Internet connection, the product story is well stacked. This will certainly alleviate the concerns of those who may want to work on their Chromebooks on a plane, or at locations where there is no Internet connection. Caching documents on local storage is not an issue, as all Chromebooks implement data encryption using tamper-resisting hardware to protect against the theft. Google thus marries the prowess of centralized processing or cloud computing to lean machines. The machines featured are Samsung and Acer. Samsung’s notebooks have 12.1″ displays, Atom Dual-Core processors, 16 GB solid state drives, weigh 1.48 kg and get 8.5 hours of continuous usage. They’re similar to the Acer notebooks, which have 11.6″ displays, a higher resolution, but only get 6 hours of usage. Some of the notebooks include 3G support, while other notebooks are Wi-Fi only.The onboard processor is an Intel Dual Core Atom, coupled with 2 GB RAM. Wi-Fi 802.11 b/g/n is going to be a standard for all Chromebooks. Variants with 3G module would also be available. Chromebook would usually sport 2 USB 2.0 ports and a memory card reader. Unlike the Samsung s line up, Acer will have a Chromebook with HD-out feature. Both companies will be releasing two or more variants with minor differences. 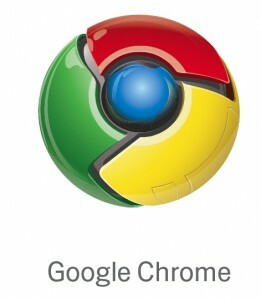 Google has been mulling as to how it extends the Chrome browser into a full operating system. A month back, Chrome started shipping a first run of test units so that developers, reporters and analysts could begin to evaluate Google’s efforts. Chrome is part of one of Google’s efforts to develop an operating system for laptops that does just about everything inside a browser window. To put it the other way around the computing experience shifts into the browser and the OS shifts the clouds. Netbooks using the Chrome will not require large 160 GB hard drives since all the OS functionalities and the data is moved into the cloud. The idea of network computers that deliver all their functionality from somewhere other than the hard drive has been around for more than a decade. Sun and Oracle tried to jump start the market, but it is the power of the clouds, Google and HTML5 which would make this network computing OS a reality. The question is whether Google has created a new environment that will challenge more traditional PC operating systems such as Mac OS and Windows, or whether Chrome will be the latest challenger that ends up with niche success at best. The magic of HTML5 means there’s a plethora of apps in Google’s Chrome store that work well. However, its the simplicity of Chrome OS that could make it powerful. Imagine logging on to any computer in the world with your Google account and seeing exactly your own home-screen. This kind of a computing experience has a lot of appeal. Google is clearly envisioning a future where more and more value for more and more users can be delivered via the Web in a way that makes it all easier to use and manage. While, Chrome OS notebooks aren’t going to take over the market anytime soon, but this platform is going to push things forward as businesses look to simplify the computing platforms they support. The trend that Chrome OS represents will only accelerate as more HTML5 apps deliver richer experiences over time. Most mainstream accessible HD video both online and off today is encoded in H.264 and would need to be either transcoded or put into a Flash container to be viewable in Chrome. Some developers and video editors have said they plan to abandon Chrome as an explicit target since they would have to support at least two and possibly three video implementations to get Chrome to work. Third-party plugins may work around the flaw, but critics have noted that Google so far hasn’t been consistent in dropping proprietary formats and still has fully integrated Flash. Google, with the growing popularity of its Android mobile OS and the recent introduction of Google TV, packaged into electronics by technology companies like Logitech, is growing its reach to the point where it could perhaps mount a challenge to H.264 across all screens. However, Chrome dropping support for H.264 is a half move really because Google continues to support H.264 in its Android mobile operating system and will likely will probably continue to serve thousands upon thousands of videos in H.264 via YouTube. That makes Google’s Chrome-only announcement relatively impotent. Depending on whether Google chooses to extend this technology decision to its other products, the dropping of H.264 support in Chrome could be either hugely influential or dismissively foolish. Chrome believes that the licensed H.264 codec that is currently supported by Microsoft and Apple stifles the cause of open web and innovation. In an earlier post, i had written about the benefits and pitfalls of Chrome dropping H.264. This post examines the Chrome alternative to H.264 and the eco-system view of he same. Google spent around $107 million in 2009 to buy On2, makers of a video codec called V8 that it later open-sourced under the name WebM. 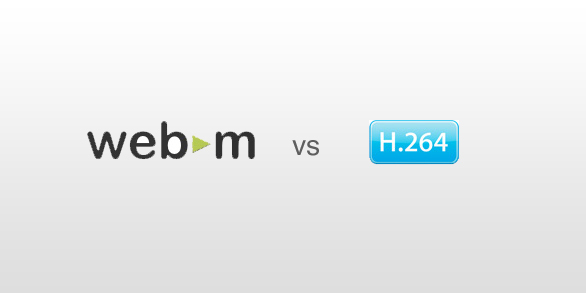 Chrome’s move could boost adoption of WebM at the expense of H.264. Or perhaps it’s the first step in an attempt to overthrow the H.264 altogether, a move that would probably impact Apple’s screen-spanning media empire and not likely that of Adobe’s Flash since Adobe has expressed intent to support WebM in near future. 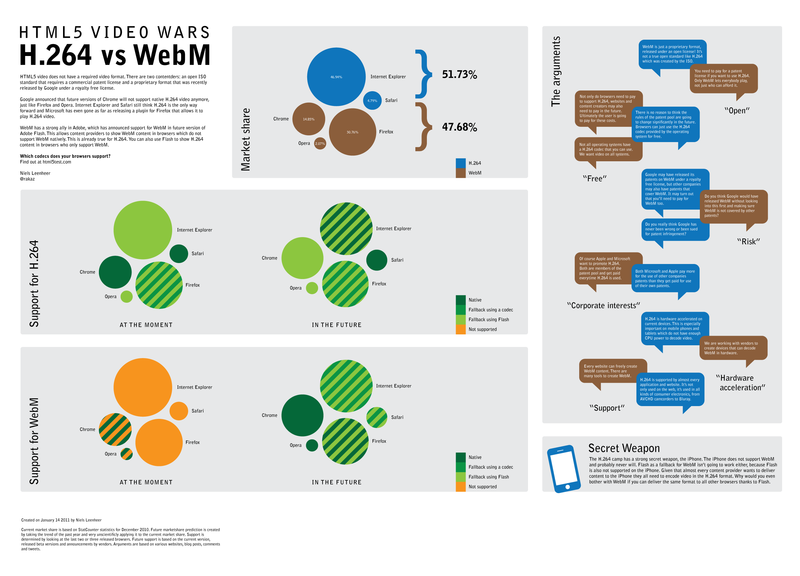 WebM is currently supported by only 17% of browsers whereas, H.264’s has big benefits from iPads to set-top-boxes it works on most of the screens people use. To unseat H.264 in popularity, Google’s WebM standard would have to find support across all the screens we use. This puts Google at odds with Microsoft, which has publicly declared its support for H.264 as the default video codec in IE9. Microsoft has already likened the Chrome decision to drop H.264 to abandoning English.More importantly, it puts Apple between a rock and a hard place. Apple doesnot support the Adobe Flash and now Chrome will not deliver H.264 coded content. That nixes Apple’s media content. One vital question is whether future versions of Chrome will actively block the installation of H.264 support via plug-ins, especially in devices running the Chrome OS. If Google takes that drastic approach, it risks alienating content providers and developers. Apple and Microsoft currently support H.264 in HTML5 and, as the defaults browser providers for their respective platforms, are likely to keep H.264 in majority use. Mozilla’s Firefox and Opera’s self-titled browser currently only support open formats like WebM and Ogg Theora, but both currently have flat market share where only Chrome and Safari have been seeing measurable gains. Recently Chrome announced that it was taking off support for H.264 video codec triggering a debate about video codecs, future of open internet and the “do no evil” Google philosophy.The objective behind Chrome’s boycott of H.264 seemingly is to enable open innovation, and directing Chrome resources towards completely open codec technologies. This post examines pros and cons of Chrome’s decision of dropping the H.264. H.264 is a “codec” that compresses video in a way that makes it good for streaming. H.264 makes video cheaper to package into physical media like BluRay disks and cheaper to send over the Internet via services. It’s often used to encode HD cable channels and is used as part of the preferred format for Apple’s iOS devices. Google’s main issue against H.264 is that the ideas behind it are patented, so any software makers who want to encode or decode H.264 video have to pay into a licensing pool called MPEG LA once their audiences reaches a certain size. For Chrome-only licensing, Google could save a capped $6.5 million per year in license fees.H.264 can [be] expensive for software and hardware developers to license if it doesn’t fall into this narrow line of use. MPEG LA, the keeper of the H.264 codec, told Mozilla to cough up $5 million to license H.264 in the Firefox browser–which is why there’s no H.264 support in Firefox. However, it really is not about money. Google’s royalty fees for the H.264 codec are literally a rounding error on top of a rounding error. $6.5 million over Googles revenue machine of $17.68 billion. Google is the largest provider of video content on the web and has sworn allegiance to HTML 5 as a tool for enforcing open standards on the web. This all augurs well in line of supporting the small developers and content providers on the web free of any licensing requirements. Google is taking the long view, and wants video to be unencumbered go forward, so it can flourish just like HTML and the web did. The codec form that Chrome is supporting currently, VP8 or WebM in its new avatar has not been upto mark.Practical studies have shown that H.264 uses LESS power and can deliver HIGHER QUALITY content than VP8 at the same bitrate. Virtually all codecs are based on patented technology, and many of the essential patents may be the same as those that are essential to AVC/H.264. Therefore, users should be aware that a license and payment of applicable royalties is likely required to use these technologies developed by others, too. However, licensing H.264 costs a relative pittance for larger companies because licencees not only get to use the H.264 codec, they also get the right to use an enormous portfolio of patents from 26 companies in the pool administered by the MPEG Licensing Authority (MPEG-LA).That provides security against patent-related lawsuits. Indeed, it was a key reason for Microsoft’s decision to adopt H.264. Thus, H.264 provides the best certainty and clarity with respect to legal rights from the many companies that have patents in this area. However, H.264 has serious advantages which could backfire seriously on this choice that Chrome has made. Consider this: Just about every modern graphic processing unit (GPU) now has H.264 decoding built into the silicon, and IE9 is going to take advantage of hardware acceleration for graphics and text.” That has a huge impact on performance, battery life, and heat, all of which are crucial to the next wave of computing platforms. While, the Chrome announcement could foreshadow an announcement by Google of dropping of H.264 support across all screens and all products, but in the meantime H.264 is so widely used that for Chrome users it will likely mean another addition to an already significant amount of incompatibility issues on the Web — issues that end up being solved by plugins and other installables that popup and annoy users.